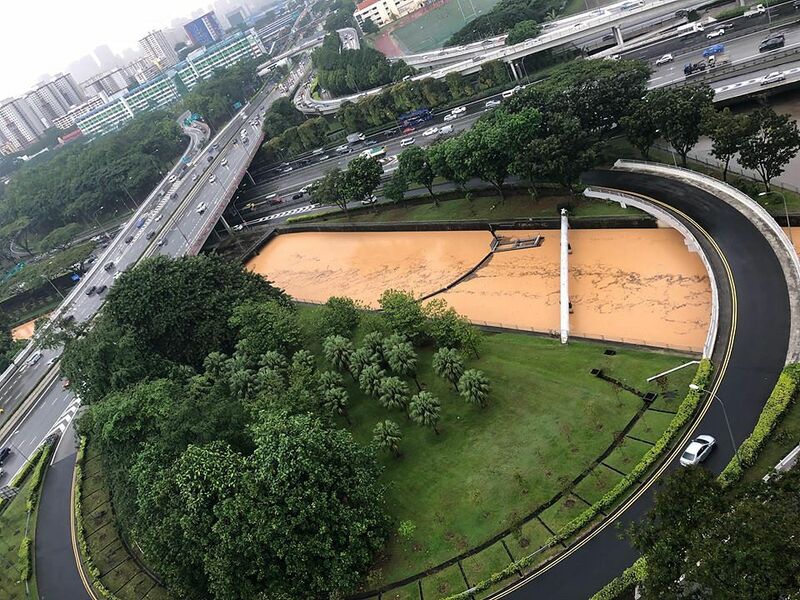 SINGAPORE - Heavy rain in the Bishan area on Saturday (April 7) caused rainwater to seep into the MRT station at nearby Marymount. When The Straits Times was at Marymount station at around 6pm, workers were sweeping away water that had pooled inside the station. A worker said it had happened earlier, as there were heavy showers and rain seeped through. National water agency PUB had issued flood alerts for Bishan earlier. It said in a tweet at 4.45pm that the water level in its "SG Kallang" measuring water level station in Bishan Road had risen above 100 per cent. It had cited the National Environment Agency (NEA) in an earlier tweet, saying that heavy rain was expected over many areas from 3.40pm to 4.30pm. Meanwhile, the rain had swelled the water in the canal in the Boon Keng area, turning it muddy. ST reader Winston Cheng sent in photos of a tea-coloured canal, taken from his home in St Michael's Road at around 5.45pm. "There was heavy rainfall just now," said the 36-year-old private teacher who has lived there for six years. "The river comes from Balestier, but I don't know why it's this colour. I've lived here for six years - sometimes the water level can be as high as this, but not this colour." According to NEA's website, rain is forecast across the island from 5.30pm to 7.30pm. Afternoon thundery showers are also forecast for the next two days. The Meteorological Service Singapore had said in its fortnightly weather outlook that weather for the first half of April is expected to be warm, with some thunderstorms - at times intense - occurring in the afternoon and evening. This is due to the inter-monsoon conditions that are prevailing, a switch from the north-east monsoon season that Singapore experienced earlier this year.